Produktinformationen "AR: HypotULTRA (7804) 4-in1 Tester"
The HypotULTRA Electrical Safety Tester is the premier Electrical Safety Tester for Laboratory and Production Line settings. In a world where data is king, HypotUTLRA improves traceability with on-board data storage and allows you to automate Electrical Safety Testing with a variety of communication interfaces. Increase efficiency with our direct barcode scanner connection and intuitive touch screen interface. 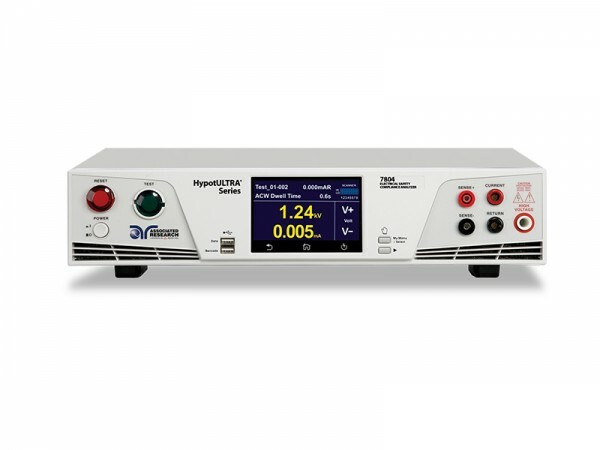 Models 7804 and 7854 are a 4-in-1 solution with the addition of 40A AC Ground Bond test capability added to HypotULTRA’s already impressive feature list. HypotULTRA is a dielectric analyzer designed to take your production line to the next level. Weiterführende Links zu "AR: HypotULTRA (7804) 4-in1 Tester"